These pages, dating from 2004, are now archived and haven't been updated in recent years. See York Walks: 2004 - about these pages for background, and the main site yorkstories.co.uk for more up-to-date information on York and its changes. 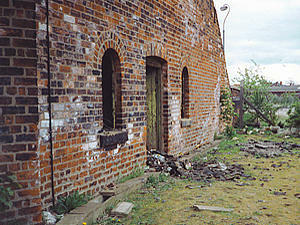 During my wanderings in 2004 I've found many abandoned buildings. This building, pictured right, was photographed in 1995. 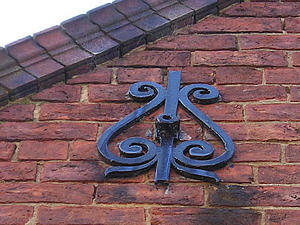 It was somewhere off Cinder Lane, off Leeman Road, near the footbridge over the railway lines. It may still be there, unoccupied and mysterious, but I can't tell. There was an open gate when I visited in '95, but it's closed now, and locked. In the past I didn't often waste expensive camera film and developing costs on old abandoned buildings. Now I've got a digital camera I can record all of these buildings I discover on my wanders. As I've walked around York this year I've noticed many buildings that seem to have come to a turning point, and have a planning application in their windows, or are in limbo, between one use and another. Note – October 2006: this page was compiled in 2004. Please see the links in the text below for updates, where available. 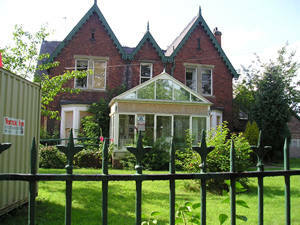 This house, once the home of J B Morrell, is to be demolished so that Barratt can build new residential accommodation. 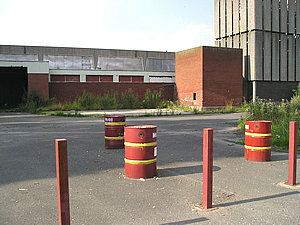 The decision was made in summer 2004 by City of York Council. 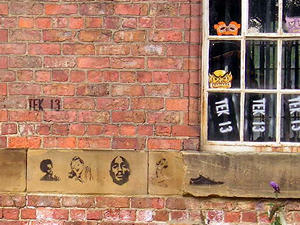 There's a page on this site about this building: York Walks /3 : Burton Croft. Photographed on 21 July 2004. The White Swan Hotel on Piccadilly has been empty and abandoned for as long as most of us can remember. 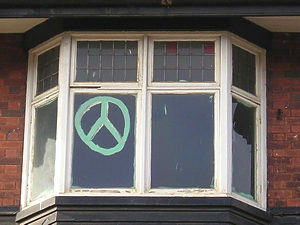 It was occupied for a time by the York Peace Collective, and the windows still show signs of that occupation. Photographed on 15 August 2004. 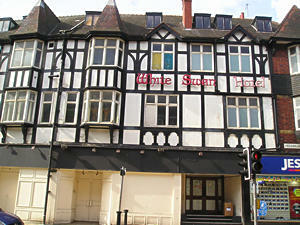 Update: the building is still empty, but for more info see Buildings – White Swan Hotel, Piccadilly (from Feb 2011). The recent developments here – or indeed lack of them – are rather confusing. 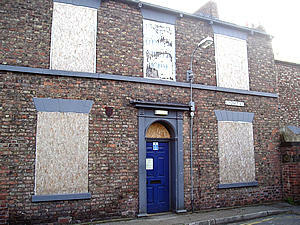 The City of York Council apparently discovered this was a listed building, after they discussed selling the site. (It's odd that they didn't know it was listed, as it belongs to them.) 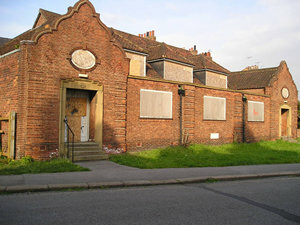 Recent reading suggests it was the first school built by the architect Brierley, who then went on to design many of the schools in York, including the much-admired buildings on Scarcroft Road and Poppleton Road. 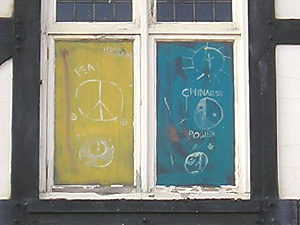 Photographed on 23 July 2004. Update: This building is still empty. See Buildings: Shipton Street School for more information. 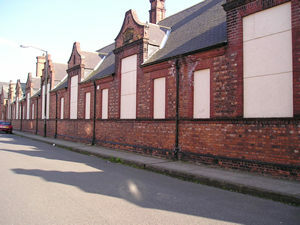 Most of the Clifton Hospital site has been redeveloped, but a few of its Victorian buildings remain, as does this 20th century laundry. I don't suppose many people will want to protect it from redevelopment, but I've included it, as the official planning application notification has just appeared in the local paper. Ugly or not, it deserves recording before it's demolished. More about this building and others nearby in Forrmer Clifton Hospital site. Photographed on 7 August 2004. Update: This building was being demolished by the autumn. 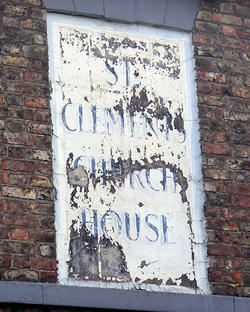 See York Walks /4: Clifton hospital site – revisited. A new medical facility now occupies the site. The sign above right is from the building pictured above left, which is on Cygnet Street, and I think is connected to this other boarded-up building which seems to back onto it, but which faces onto Moss Street. I know that a planning application to redevelop the St Clement's Church Hall was refused. I believe that some kind of deal has been done so that instead the developers are building on the Moss Street depot just along the road from the building pictured left. Photographed on 27 July 2004. This is a very beautiful Victorian warehouse, and the photo left is just a detail of some of the graffiti that has covered it since it's been standing empty. Update: It's still empty, though work did begin on its refurbishment. See Buildings: Bonding Warehouse. Page compiled in 2004. Last updated 9 Feb 2012.